Dynamics 365 is one of the most searched ERP solutions to date as it as available for use from any device anywhere. But the names can be confusing. What is Dynamics 365? Why are Microsoft's two versions? Dynamics 365 Enterprise Edition (otherwise known as 0f 07/01 as the United Operations Plan) and Dynamics 365 Business Edition are two of Microsoft’s most prominent cloud-based accounting software package solutions otherwise known as Software as a Service (SaaS). Both Enterprise Resource Planning (ERP) solutions provide you with a host of business management tools from CRM to finance, sales, inventory, and purchasing functionality. The software must be purchased as a service in the cloud. As the software is hosted in the cloud the two options can be accessed from nearly any smart device letting you work from anywhere with WiFi. An additional benefit of being a cloud offering is that both software programs have a high degree of scalability without needing or scheduling an IT team. The changes in users happen with a few clicks*. If you are considering ERP software, it is important to distinguish between two of the bestselling solutions as the software is designed for two different business audiences, and more than likely one of the two business applications will fit your business’s needs. How Do You Differentiate Between Dynamics 365: Business Edition VS Enterprise Edition? 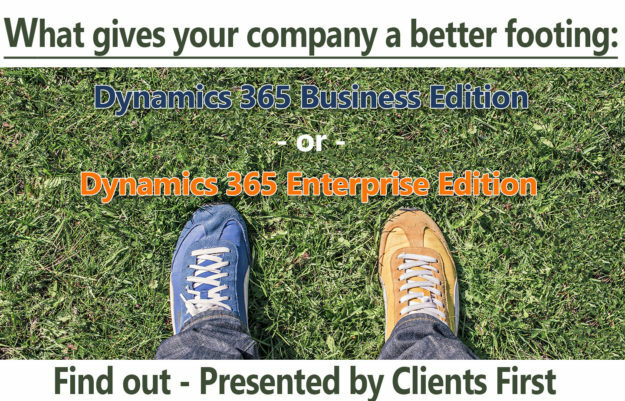 Speaking simplistically, the easiest way of differentiating Dynamics 365 for Enterprise Edition (aka Dynamics AX + CRM) from Dynamics 365 for Business Edition (aka the new NAV + CRM) is establishing the audience for which they are designed. Dynamics 365 for Business Edition can be purchased as an individual app or as a part of Dynamics 365 Business Edition, which comprises SMB focused sales, service, and marketing applications. It also comes at a lower cost and targets companies that have between 10 to 250 employees. Dynamics 365 for Operations can be purchased as an individual app or as a part of Dynamics 365 Enterprise Edition Suite. Your company should consider this software if your organization has more than 250 employees. This is because it is designed for firms that have complex ERP and financial needs alongside a need for extensive analytics and integrations. The functionality of Dynamics 365 for Operations truly goes on and on. It doesn’t do your business laundry all by itself, but with IoT functionality, it can send alerts that the washer needs to be started. However, if your business has the functionality of robots, it certainly could do your laundry. Find out more by visiting our Dynamics 365 for Operations Page. Dynamics 365 Business Edition offers you simple accounting functionality including basic multi-company support. In addition, it has fewer security controls and multi-dimensional analysis. The finance software in Dynamics 365 Business Edition uses internal parameters and account schedules to generate financial statements. When using it, you may end up creating your financial reports in Excel. Dynamics 365 for Operations offers you a more flexible system of accounts, user setups, company setup, and cost accounting. It similarly has the ability to support multiple firms with different or similar inter-company transactions, GL’s, and consolidation while eliminating entries. Dynamics 365 is based on light-user and full-user subscription models. You are advised to choose the first price model for your employees if your employee complete light tasks or consume less data. This may include updating your company’s HR records or time and expense entries. When you choose Dynamics 365 Business Edition for your business, you must pay a subscription fee of 40 dollars per month for every user. The light users monthly fee is $5, not 40. Note: Even though the software is less expensive than the enterprise edition since the functionality is not as robust, your business might require add on features. These additional features implementation and monthly cost could be just as much as Dynamics 365 for Operations and Finance. You will not be restricted to a minimum user count when you purchase Dynamics 365 Business Edition software; however, the software helps companies more if they have over 20 users. The limit on users has a threshold of 250 team members. Dynamics 365 for Operations and Finance has a more intricate pricing model. The individual app can be purchased in the cloud, in a hybrid application, or on-premise. As of May 2017, the pricing starts at $190 per named user. The Enterprise Edition gives your company CRM plus ERP and starts at $210 per month. Come back to our blog in the future to learn what conditions apply for team member pricing. If you want more information on Dynamics 365 whether Business Edition or Enterprise Edition and our services, we invite you to get in touch with our friendly advisers at Clients First Business Solutions. *Changes in users affecting scalability is usually very simple, unless you are using Dynamics Business Edition, and need over 250 users. Business or Enterprise Edition, Which Dynamics 365 Licensing Option Should I Choose?